This Commons Transition Special Report was written by Sharon Ede, a sustainability ideas transmitter, writer and activist working in Adelaide, Australia. Ede is also a co-founder of the Post-Growth Institute, one of Commons Transition’s most esteemed Partner Projects. We feel that the Post-Growth Institute’s work, specially their exploration of not-for profit business models, aligns with our own work on Open Cooperativism. These projects forge resilient livelihood strategies for commoners, a trend which is explored in this report. Going beyond issues of labor organization, “The Real Circular Economy” also explores how and why we produce, paying special attention to prosperity, societal resilience, and the possibilities offered by relocalized production and desktop/benchtop manufacturing. This parallels the P2P Foundation and P2P Lab’s work on “Building the Open Source Circular Economy”, where we research and build upon global, open-access design repositories working in conjunction with on-demand, locally grounded and community-oriented micro-factories. This approach, known as “Design Global, Manufacture Local” is also explored in this report, making it one of the most complete, accessible overviews of P2P and Post-Growth economics. As always, we’ve indexed the report. You can read it sequentially or jump to any of the sections below. You can also read the original in PDF format or consult the different sections and comment on the document in the Commons Transition Wiki. In recent years, the idea of a ‘circular economy’ has come to the fore as a way to tackle carbon emissions and waste. It has gained traction with thought leaders and jurisdictions around the world as a way to stimulate economic growth, foster innovation and generate employment. The circular economy builds on concepts including zero waste, cradle to cradle and biomimicry. It is focused on creating economic value and reducing environmental impact through design, highest and best use of materials, and efficient use of resources and energy. …one that is restorative and regenerative by design, and which aims to keep products, components and materials at their highest utility and value at all times, distinguishing between technical and biological cycles. How we design, make, use and manage things at the end of their useful life has enormous implications for everything from our demand on nature’s resources, our carbon impact, and the amount of waste we generate. Efforts to crystallise and focus attention on creating a circular economy have created a huge awareness of, interest in and momentum for approaches that make a lot of environmental and economic sense. At the same time, a technological approach to the circular economy is necessary, but not sufficient, to get us on track for a secure future. The principles of a circular economy speak to material resources and our systems of managing them, however with a few exceptions, such as Douglas Ruskhoff’s call for ‘reprogramming our economic operating system’, Rammelt and Crisp’s ‘systems and thermodynamics perspective on technology in the circular economy’, and Christian Arnsperger and Dominique Bourg’s call for ‘perma-circularity’, there is little mention in contemporary circular economy debate of the wider milieu of economic, social and cultural systems in which a circular economy must operate. Adopting a broader definition of ‘circular economy’ can help us build a sustainable, prosperous and fair society. The circular economy is primarily concerned with the flows of materials and energy, and it is often taken for granted that this circulation can happen within a growing economy. However, the demand for materials and energy needs to be considered in the context of the limits of a finite planet. Materials can keep circulating through being designed for disassembly and remanufacturing, or kept in use longer through being designed for durability, but if the ‘circle’ or total demand for materials and energy keeps expanding, we have not solved our civilisation’s challenge. When human demand on nature’s capacity exceeds what nature can supply, we are in a state of ‘overshoot’. The level of overshoot is the amount by which nature’s biological capacity is being used beyond its regeneration rate – for example, overfishing or overharvesting, or emitting too much carbon dioxide into the atmosphere and destabilising the climate. The minimum, non-negotiable condition for a sustainable civilisation is to live within the means of nature – to avoid ecological overshoot. This condition is at odds with the current development paradigm which dominates both economics and politics globally, that of continuous economic growth into the indefinite future. Historically, countries have sustained this growth by appropriating carrying capacity (resources, ecological services, waste sinks) from elsewhere on the planet through economic or military power, with waste (particularly CO2) being emitted into the global commons. However this model of dependence on ‘ghost acreage’ ignores one simple reality – globally, not everyone can be a net importer of biocapacity. Once the biological carrying capacity of the planet is exceeded, ‘development’ occurs through the liquidation of the planet’s natural capital stock, switching from the reproductive use of the resource base, which leaves it intact, to extractive use, which reduces the total store. Instead of living off the Earth’s ‘interest’, humanity begins eating into the Earth’s ‘capital’. Globally, we are liquidating natural capital and calling it economic growth. It is like ripping off parts of a house to use as firewood in order to keep warm. Avoiding overshoot is not sufficient in and of itself for a prosperous, healthy society, but without it, sustainable civilisation is impossible. All other human challenges are ultimately dependent on whether we sustain or undermine the resource base and the ability of ecological life support systems to function. The destructive and painful effects of economic collapse will pale into insignificance in the face of the consequences of ecological collapse. How can we know if we are in overshoot? The majority of the resources people consume and the wastes they generate can be tracked, and most resource and waste flows can be converted into the biologically productive area required to maintain these flows. The Ecological Footprint is a resource accounting method and tool which measures how much biologically productive land and water area humanity uses to produce the resources it consumes and to absorb the waste it generates, using prevailing technology and resource management, wherever on Earth those bioproductive areas are located. It aggregates human impact on the biosphere into one number, a common currency of global hectares, or the bioproductive space occupied exclusively by a given human activity. This allows comparison of supply (or biocapacity) with demand (the Footprint, or consumption) to determine whether we are in overshoot – or using more ‘nature’ than is available. The Global Footprint Network maintains a series of biophysical accounts for over 200 countries, dating back to 1961. The Ecological Footprint account of each country is determined by a complex spreadsheet designed to enable calculation of a country’s per capita Ecological Footprint, and compare that number with the biocapacity of the country and planet. Official data from the UN Food and Agriculture Organisation (FAO) and the International Energy Agency (IEA), and data from a range of other reputable international sources, form the basis of national Footprint accounts. The spreadsheets, which comprise thousands of data points, track a country’s production, import, export and consumption of a vast range of commodities – including food and fibre crops, timber and fossil fuels – in biophysical units (or volume of material eg. tonnes) rather than monetary units, which only reflect market value, not availability in the biosphere. Each category includes both primary resources, such as raw timber or milk, and manufactured products that are derived from them, such as paper or cheese. The Ecological Footprint accounting methodology is deliberately conservative, to avoid exaggerating the Footprint, and is therefore likely an underestimate. Footprint accounting also trade corrects – revealing where countries are ‘outsourcing’ impacts like greenhouse gas emissions. The Ecological Footprint is an indicator, and indicators are sensors. To be effective sensors, they must incorporate feedback mechanisms about the limiting factors of systems, so that it the system knows how to react to impending danger. In this case, the limiting factor is the biological capacity of the Earth, and how much of it humanity is consuming. Each year, the Global Footprint Network calculates Earth Overshoot Day – the day on which globally, humanity’s consumption (Ecological Footprint) exceeds what the Earth’s biocapacity can supply. The remainder of the year, we are in global overshoot. 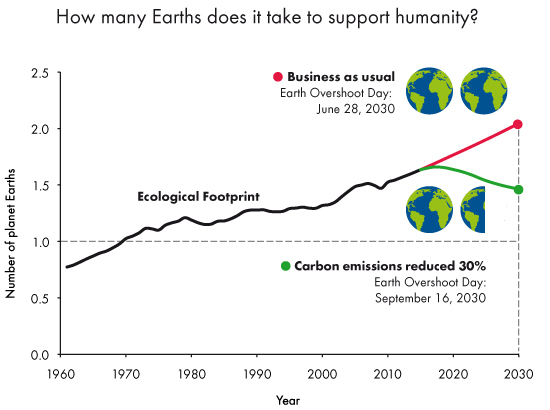 Earth Overshoot Day is determined by dividing the planet’s biocapacity (the amount of ecological resources Earth is able to generate that year), by humanity’s Ecological Footprint (humanity’s demand for that year), and multiplying by 365, the number of days in the year. In 2016, Earth Overshoot Day was 8 August – on that date, we began exceeding ecological limits. How can we be using more than nature is regenerating? Ecological limits can be easily exceeded – for a while, we can harvest more than what grows – creating the illusion that limits can be transgressed without apparent consequences. The reality is that overshoot eats into nature’s reserves, weakening its ability to regenerate. The Global Footprint Network accounts show that humanity uses around 1.5 planets’ worth of bioproductive space, meaning the Earth takes one year and six months to regenerate what we use in a year. If population and consumption trends continue on their current trajectory, we will need the equivalent of two Earths by 2030. There are billions of people whose material living standard needs to increase, and many who wish to emulate consumerist lifestyles. The defining question of our age is not whether we can achieve the impossibility of sustaining more than nine billion people on a western industrial model of development, but how to deliver prosperous lives for the global population within the regenerative biocapacity of one planet. Sustainability is like buying a chair. There’s no question whether the chair should be strong enough to sit on or not. That’s the non-negotiable condition. The questions are: Do you want a red one, a green one, a wooden one, a metal one? But not whether the chair is strong enough. This sustainability challenge will be won or lost in cities, which are now the most common human habitat, primary economic drivers, and the most powerful physical and political leverage points for change. To win the challenge we need to build, and reconstruct existing cities, as ecological cities. Among many objectives, ecocities seek to ensure that cities’ demands on the Earth are within the Earth’s biological capacity. An Ecocity is a human settlement modelled on the self-sustaining resilient structure and function of natural ecosystems. The ecocity provides healthy abundance to its inhabitants without consuming more (renewable) resources than it produces, without producing more waste than it can assimilate, and without being toxic to itself or neighbouring ecosystems. Its inhabitants’ ecological impact reflects planetary supportive lifestyles; its social order reflects fundamental principles of fairness, justice and reasonable equity. Right now, there is no city on earth that is an ecological city. Twenty-first century cities are the primary resource manipulators on the planet. They are a meta-technology – a technology that organises other technologies. But it is precisely because they are such powerful drivers of all kinds of activities that the way we build and live in cities is the key to addressing social and environmental impacts everywhere. In the mid-2000s, a University of Michigan study showed that human activity moved 10 times more soil than all natural processes combined. In the mid-1990s, Herbert Girardet, author of the Gaia Atlas of Cities, estimated the Ecological Footprint of London, and found that it was 125 times the actual surface area of that city, in terms of the space it needs beyond its physical area to produce the resources required to sustain its citizens. Cities are dependent on biophysical capacity and labour, both local and transnational, in order to deliver the needs of their populations. In doing so, they draw on the ecosystems and commons of other communities. It is imperative that we understand the city as an ecosystem, acknowledging and addressing the behaviour of these mega-organisms, and their impact beyond the physical city. These impacts and planetary ecological limits are typically not connected to an individual’s personal experience, and are rarely felt by more than the half of humanity who live in cities and towns. People in urban environments are rendered psychologically as well as spatially divorced from their dependence on nature, especially those who are caught up in a consumer culture that promotes abundance and has not yet encountered ecological limits. If the true demand of the city was made visible, it would show that all urban areas are running ecological deficits – that is, they depend on ‘occupied territory’ elsewhere. 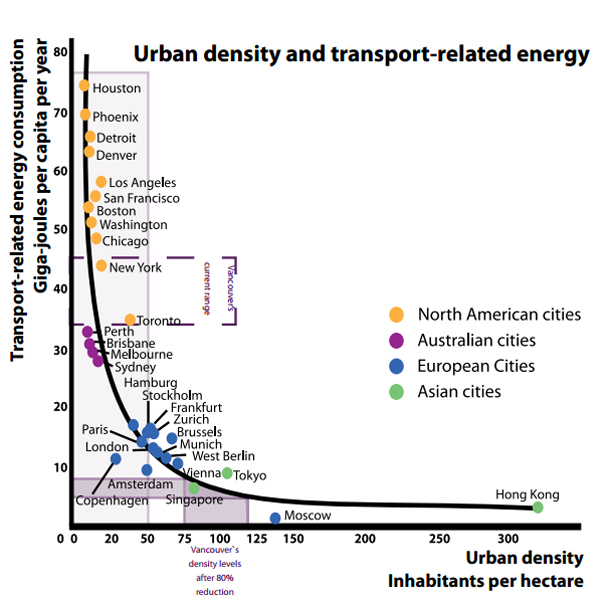 The needs of urban dwellers are also dependent on extensive external supply lines, which are a large contributor to carbon emissions. Shipping is projected to be responsible for 17% of global emissions by 2050, and incredibly, both shipping and aviation are excluded from international climate change negotiations due to the difficulty of allocating emissions to one country. Creating an ecological city and reducing the city’s Ecological Footprint does not mean the end of trade – it just means trade happens where it is necessary, not where it isn’t. Instead of transporting UK-caught langoustines the relatively short distance from sea to factory to distributor, Britain’s leading seafood supplier will send them on a 13,000-mile round trip to Thailand – in the interests of cost-cutting. The shellfish will then be repackaged and shipped back to the factory where they began their journey. Eventually, they will be breaded and sold across the UK. Research by Germany’s Wuppertal Institute revealed that a typical container of strawberry yoghurt clocked up over twelve thousand miles of transport in the process of being made, assembled into its pot and delivered to the point of sale. All around us still, are ships, lorries and planes passing in the night, wastefully carrying often identical goods from city to city across the globe and back again to meet ‘consumer demand’…we export 4,400 tonnes of ice cream to Italy, only to re-import 4,200 tonnes. We import 22,000 tonnes of potatoes from Egypt whilst exporting 27,000 tonnes back again. Then there are the 5,000 tonnes of toilet paper heading from the UK to Germany, with over 4,000 tonnes returning, and 10 tonnes of ‘gums and jelly’ sweets going back and forth to Thailand. And 117 tonnes of sweet biscuits, waffles, wafers and gingerbread came into the UK, rumbling past 106 tonnes headed in the opposite direction. Cities, with their immense economic and political power, are central to global and local ecological problems, and they must become central to solutions. Cities should not only do less damage, but proactively work as an environmental repair kit – become biogenic, or generative, not biocidic, or extractive. An ecocity, in symbiosis with its region, is a lifeboat for human civilisation, an ark for defence of the biosphere, a regulator of the global climate, and a fractal of our sustainable future. To successfully reduce our ecological footprint and move out of overshoot, we need to build ecological cities, including relocalising production of food, energy and things. For cities to produce more of what they consume locally, they need to become productive, fabricating (making) cities – Fab Cities. The first city to become self-sufficient – simultaneously increasing employment by creating opportunities through open innovation, and radically reducing carbon emissions by re-localising production – will lead the future of urban development globally. Digital technologies can either amplify and accelerate cities’ ecological devastation, or be channelled to create positive change, such as through digitally sharing open source design enabling distributed production. A Fab City is a locally productive, globally connected, self-sufficient city. ‘Fab’ is short for ‘fabrication’, making and producing. Fab Labs (Fabrication Laboratories) and makerspaces offer opportunities for people to make and produce what they need for themselves, and to bring back to citizens the skills and knowledge needed to make things. Makerspaces and Fab Labs are open access workshops, which means that anyone can access a range of production equipment (including but not limited to 3D printers and other means of digital fabrication) and networks of knowledge. Fab Labs (Fabrication Laboratories) emerged from the Center for Bits and Atoms at MIT in the early 2000s, originating from a course designed to enable anyone to learn how to make almost anything. Harnessing these spaces and digital manufacturing technologies in service of the circular economy offers the potential for returning production to cities in the form of distributed manufacturing with microfactories – small scale, cleaner production that is also less wasteful, occurring as-needed, often customised, instead of over-producing for markets. The Fab City Global Initiative, which originated in Barcelona in 2014, has expanded with the network now including Amsterdam, Shenzhen, Copenhagen, Detroit, Paris and Boston, who have all joined the challenge of leveraging the capability of Fab Labs to relocalise production of energy, food and things in cities to 50% by 2054. FAB City takes the ideals of the Fab Lab – the connectivity, culture and creativity – and scales it to the City. It is a new urban model of transforming and shaping cities that shifts how they source and use materials from ‘Products In Trash Out’ (PITO) to ‘Data In Data Out’ (DIDO). This means that more production occurs inside the city, along with recycling materials and meeting local needs through local inventiveness. A city’s imports and exports would mostly be found in the form of data (information, knowledge, design, code). If the idea of digital trade seems peculiar, it is worth noting that a recent McKinsey report revealed that …‘digital flows—which were practically non-existent just 15 years ago—now exert a larger impact on GDP growth than the centuries-old trade in goods.’ Fab Cities are about swapping the ‘recipe’, not the ‘cookies’. Fab Cities are not defined as a city full of Fab Labs, but are about reinvigorating old industries to make them more clean, dynamic, fast and adaptive, and connecting them with grassroots innovation. • Fabrication & materials: with complementary production ecosystems happening inside the local network of Fab Labs, citizens have the possibility to produce what they consume, recirculating materials inside the neighbourhood and the city to reduce waste and carbon emissions associated with long-distance mass production and distribution chains. • Food production: growing food on the rooftops of Barcelona. Through urban agriculture practices, citizens can grow part of what they eat turning production of local clean food in a regular part of their lives. • Energy: Renewable energy production. With the arrival of domestic batteries and the cost drop of solar technologies, citizens have the tools to produce part of their domestic energy consumption. Using digital fabrication as its main focus, the network promotes the idea of distributed manufacturing. With this model, designs can be sent to the other side of the planet, modified and made on the same day.…you can find a variety of locally made products designed by people from all over the world. All products are open-source and sold ready for use, assembly or fabrication, giving people the possibility to participate in the making process. The more you participate, the less you pay for the product. Other terms being used to describe the approach advocated by Fab City include ‘Design Global, Manufacture Local’, and ‘cosmo-localization’. In all cases, this means the ‘light’ things (bits, information, shared/open source design) travel, but the ‘heavy’ things (atoms, the physical, manufacturing) stay local. The circular economy approach can reduce demand for energy and materials and production of waste, but if a city is not making things locally, does it truly have a circular economy? A city that is exporting recycled materials elsewhere to be remade into things arguably still has a linear economy. Our oceans churn with carbon-intensive cargo movements. A true circular economy means relocalising production in our cities, needing to move less stuff, and making more of what we need, when and where we need it. The Fab City approach offers potential to cut carbon emissions, reduce waste, and generate local jobs, however relocalising production in cities does not necessarily mean relocalisation of jobs. Adidas have announced plans to shift production of boots back to Germany from Asia – but they will be built by robots. There may be local employment of people who build and maintain robots, however the objective of replacing labour with machines will likely result in fewer job opportunities, especially for lower skilled workers who may not be able to access work roles that require skills they don’t have, or don’t have the ability or interest to train for. The 2016 World Economic Forum report, ‘The Future of Jobs’, found that technology could result in a net loss of five million jobs in fifteen developed and emerging countries by 2020. In a system where people are dependent on selling their labour for the means to sustain themselves, a conscious choice must be made to prioritise labour and generation of local employment opportunities. In many cases, it could be beneficial to automate dangerous or undesirable work, however if the choice is made to automate jobs, a lot of social benefit will be lost, even though relocalised production may deliver environmental benefits. Meaningful work is also about contribution and social identity, not just an income. A zero waste society should also mean zero waste of human potential, and this potential can be realised in ways other than seeking to match skills and aptitudes of people to fulfilling jobs – it can be realised outside the confines of paid work, outside the narrow definitions of ‘productivity’ and ‘work ethic’ that have characterised work since the start of the Industrial Revolution. It’s as if someone were out there making up pointless jobs just for the sake of keeping us all working…technology has been marshalled…to figure out ways to make us all work more. Huge swaths of people, in Europe and North America in particular, spend their entire working lives performing tasks they believe to be unnecessary. The moral and spiritual damage that comes from this situation is profound. It is a scar across our collective soul. Yet virtually no one talks about it. In the meantime, within our current construction of the idea of ‘work’, there is a bigger question – why choose to automate jobs and throw people out of work, severing them from the ability to sell their labour to support themselves? The reason is that labour is one of the largest costs for any business, and replacing workers with machines that don’t need to eat, rest, sleep or be paid a wage, enables costs to be driven down, so that profit can be maximised. An even bigger question is: in an automated world, who owns the robots, and who benefits from their productive capacity? If automation is a societal choice, it will need to occur in conjunction with a reinvention of the social contract that reconfigures the job/work/income/means-to-meet-one’s-needs nexus, possibly with a form of Universal Basic Income, or Universal Basic Dividend. Value is produced by all of society, including contributions to the commons and social reproduction in the domestic sphere, not just in the formal economy where monetised transactions occur. Private enterprise benefits from that which is created beyond its value-capturing boundaries, such as supply of a schooled workforce, and the provision of infrastructure such as transportation and power infrastructure. How can we better share the benefits of collectively produced value? One way to achieve this is through business models and modes of production that prioritise purpose over profit. Ecological cities and Fab Cities, which have many similar objectives including reduction of urban Ecological Footprints, offer theoretical frameworks and practical ways to help us move out of global overshoot. Circular economy approaches are an integral part of both. All are still embedded in and trying to change a world where the growth paradigm is dominant. The drivers of growth are many, but they include money created as interest bearing debt, planned obsolescence, consumer culture and status envy, population and the indicators that we use to manage our economic systems. Economic growth, the overriding objective of governments everywhere, is measured by Gross Domestic Product (GDP). GDP is an indicator designed to track total economic activity, developed in the 1930s and 40s amidst the upheavals of the Great Depression and two World Wars. Its inventor, Simon Kuznets, the chief architect of the United States national accounting system, cautioned against equating GDP growth with economic or social well-being in 1934. Yet eighty years on, economic growth is seen as the pathway to prosperity and wellbeing. Although many people today still lack basic needs, many more people today have a material living standard higher than that of an average citizen at any previous time in history. Economic growth has delivered that standard of living for many people. However, as an indicator, GDP is a blunt instrument in that it adds up the total monetary value of economic activity, but does not distinguish between the desirability of that activity. It does not count the value created in the non-market economy of social production – caring work, volunteering, domestic labour, ‘work for the world’. Yet every car accident, razed forest, oil spill, heart attack and break-in is counted as ‘growth’ because it results in greater production and exchange of goods and services. We are systematically incentivising unsustainable behaviours, wreaking destruction on ecosystems and communities with abstractions we have ourselves created. In order to keep growing, a system dependent on economic growth must continually convert nature into goods and relationships into services – things once provided to us as gifts become monetised transactions. Yet past a certain point, the costs of more growth – congestion, pollution, declining quality of life, inequality, destruction of ecosystem services (such as bees’ ability to pollinate or the ability of a watershed to filter and clean water) and liquidation of natural capital – start to outweigh the benefits. Economic growth becomes uneconomic growth. Persisting with economic growth in a finite system is not only foolish when growth is no longer delivering the benefits it used to and the costs outweigh the gains, it is dangerous. The ‘eat more’ message of growth economics is at fundamental odds with the ‘eat less’ message of sustainability. UN Sustainable Development Goal 8 calls for improving ‘global resource efficiency’ and ‘decoupling economic growth from environmental degradation’. Unfortunately, there are no signs that this is possible at anything near the necessary pace. Global material extraction and consumption grew by 94% between 1980 and 2010, accelerating in the last decade to reach as high as 70 billion tonnes per year. And it’s still going up: by 2030, we’re projected to breach 100 billion tonnes of stuff per year. Current projections show that by 2040 we will more than double the world’s shipping, trucking, and air miles – along with all the things those vehicles transport. By 2100 we will be producing three times more solid waste than we do today. Metrics on resource productivity currently used by governments suggest that some developed countries have increased the use of natural resources at a slower rate than economic growth (relative decoupling) or have even managed to use fewer resources over time (absolute decoupling). Using the material footprint (MF), a consumption-based indicator of resource use, we find the contrary: Achievements in decoupling in advanced economies are smaller than reported or even non-existent…two-fifths of all global raw materials were extracted and used just to enable exports of goods and services to other countries. The earth is a finite system of nutrients, resources, minerals and energy. Human impact must fit within these limits, and leave some ‘breathing room’ not only for humanity, but for millions of other species. If the absolute amount of resource and energy use is still rising, economic growth will negate resource efficiency gains. It is a global Jevon’s Paradox. Capitalism’s answer to every problem is more of the same growth and overconsumption that has wrecked the planet and the climate in the first place. There can never be a market solution to our crisis because every ‘solution’ has to be subordinated to maximizing growth, or companies can’t stay in business. Running physical ecological deficits as part of growth economics is also a financial and political security risk. The UN Finance Initiative is working in partnership with the Global Footprint Network on how to quantify natural resource and environmental risks, and incorporate them into risk assessments used by insurance companies, investors and credit rating agencies (see overview of this project, ‘Integrating Ecological Risk in Sovereign Credit Ratings and Investments’). For the world as a whole, the growth model is no longer safe – we are already in overshoot. Uneconomic growth, where the benefits flow mainly to the rich, also creates social inequality and contributes to social breakdown. In 2016, Oxfam’s report ‘An Economy for the 1%’, found that, worldwide, just 62 individuals own as much wealth the 3.6 billion who make up the bottom socioeconomic half of the world’s population. Research by authors of The Spirit Level, epidemiologists Richard Wilkinson and Kate Pickett, shows that social problems (including mental illness, drug addiction, obesity, loss of community life, imprisonment) are more prevalent in more unequal societies, even among the richer strata of those societies. Inequality affects the entire social fabric, not just those less well off. A growth economy requires ongoing consumption, which is why it promotes the defining of individual identity, focusing our attention on what we are doing to maximise our consumption and generating the income to sustain it. When the relationships of gift-giving in a community are replaced by monetary transactions, the fabric of the community unravels…in sharp contrast to the monetized world of financial security, which inexorably separates everyone from everyone else, a gift economy is an economy of obligation and dependence. Financial security is not true independence, but merely dependence on strangers, who will only do the things necessary for your survival if you pay them…the monetized life removes some of the incentives for people to adhere to social and ethical norms. Dissolution of community is built in to our system of money. In an economic system that depends on growth, pursuing more growth is entirely rational. But there is a deeper question that goes unasked: is an economic system that depends on growth itself rational? Growth is not working for most of humanity, it’s no longer working as well for those who have benefited, and it’s not at all working for the natural systems on which the security of our civilisation depends. But just like in the movie Speed, we are ‘stuck on the bus’, in a catch 22 of our own making. How can we harness economic, financial and cultural dynamics to get us safely off the growth bus before we run out of fuel, without the damage that will occur if we slow down? In this light, circular economy business models are not transformative enough, as they tend to be focused on how to unlock business growth through better management of materials. • Hire & Leasing: Hire or leasing of products as an alternative to purchasing. • Performance/Service System: Providing a service based on delivering the performance outputs of a product where the manufacturer retains ownership, has greater control over the production of a product, and therefore has more interest in producing a product that lasts. • Incentivised Return: Offering a financial or other incentive for the return of ‘used’ products. Products can be refurbished and re-sold. • Asset Management: Maximising product lifetime and minimising new purchase through tracking an organisation’s assets, planning what can be re-used, repaired or redeployed at a different site. • Collaborative Consumption: Rental or sharing of products between members of the public or businesses, often through peer-to-peer networks. • Long Life: Products designed for long life, supported by guarantees and trusted repair services. While they are all worthwhile approaches, models such as hiring or leasing and asset management are not new, and the stated benefits of these models primarily focus on the opportunities for business growth. Growth of what, and for whom? Who benefits? Should the impetus for a circular economy be restricted to opportunities for business owners? Part of the growth mythology is that ‘growing the pie’ enables wealth to trickle down, that giving tax concessions to the wealthy will result in investment and productive activity that creates jobs, however this is not necessarily the case. The lion’s share of the benefits of growth are typically privatised in the hands of a few, while the costs are socialised. Are we missing bigger opportunities to profoundly transform our societies through a broader definition of ‘circular economy’? In the business world, surplus value is typically extracted from an economic system as returns on investment to shareholders and owners, not reinvested back into the business, or society more broadly. Like our take-make-waste economy, our financial economy is also a linear economy. The primary legal responsibility of corporate executives is fiduciary, that is, to make as much profit as possible for returning to shareholders and investors. To do this, costs – like frequent flyer prawns – are externalised to the environment and to society. One report sponsored by the UN revealed that none of the world’s top industries would be profitable if they had to pay for the natural capital they consume. This externalisation also relates to social costs, and is one of the drivers of both automation of jobs, and increasing precarity and casualisation of work – over a third of the US workforce is now freelance. This focus on maximising shareholder value is now being challenged in the business arena itself. A recent study found that the super-rich, on average, invest 18% of their wealth in real estate, keep 26% of it in cash and bank deposits, use 27% of it to buy more equity in companies, and put 30% of it into hedge funds, derivatives, securities, currency trading and bond markets. The wealthy essentially extract the surplus from the real economy of goods and services, putting most of it into the elite economy of business equity, shares, securities, derivatives, money markets, and hedge funds. We call this the elite economy because it is a speculative market that only those who have a certain amount of extra money can afford to bet in. How can we stop this astronomical flow of wealth being siphoned into the elite economy? One powerful way is to change how value is shared and distributed. There is increasing momentum in support of employee/worker owned co-operative enterprise, including platform co-operatives – such as a ridesharing platform owned by the drivers and other stakeholders, rather than the benefits flowing back to suppliers of venture capital. Even more broadly, open co-operatives share the wealth and governance of a business with all stakeholders who wish to participate. Complementary and local currencies, including cryptocurrencies, can play a role, locally and transnationally. Commons-based peer production is a term coined by Harvard Law School professor Yochai Benkler to describe a new model of economic production in which the creative energy of large numbers of people is coordinated (usually with the aid of the internet) into large, meaningful projects, mostly without traditional hierarchical organization or financial compensation. He compares commons-based peer production to firm production (where a centralized decision process decides what has to be done and by whom) and market-based production (when tagging different prices to different jobs serves as an attractor to anyone interested in doing the job). Michel Bauwens, Founder of the Foundation for Peer-to-Peer Alternatives, cites the emergence of global open design communities, which through open contributory systems are now able to massively scale co-operation in creating commons projects of value, like Wikipedia, Rep Rap and Arduino. Around these commons, there are extractive business models on how to maximise profits from these commons, but also generative business models. This is a new type of economy, where people organise to make a living without destroying the commons, and find democratic solutions to work together. Enspiral produces a commons, Loomio, which is an open source decision making software for virtual teams. Around that, they have numerous business ventures that seek to solve human and ecological issues. The Enspiral Foundation is the entity that manages their common infrastructure. When value is captured by extractive models and not reinvested in the commons, it creates economic uncertainty and insecurity for many people. Commons based peer production seeks to change that dynamic, returning the rewards to those who generate value and contribute to the commons. How can capital be accessed without those needing it being beholden to investors indefinitely? One approach is that of ‘capped investments’ where investors are guaranteed an agreed percentage of return on investment, but over a time period that eventually expires, rather than requiring the enterprise to continue to provide a dividend in perpetuity. This is an example of ‘transvestment’, reversing the effects of the wealth siphon by transferring value back into the ‘real’ economy. Such a scenario would need investors who seek a fair financial return – but not a never-ending return of claims on wealth from value generated by others – and a willingness to invest for positive and environmental impact. All of these examples shift us away from an extractive economy to a regenerative economy. A powerful approach detailed in the Post Growth Institute’s forthcoming book, How On Earth, makes the case that not-for-profit business models – which prioritise purpose/mission ahead of profit – will become the core of the global economy by 2050, because they will outperform business whose primary focus is profit. How often do we hear the term ‘for-profit business’? It is assumed that all businesses are for-profit, just as it’s assumed all markets operate on the basis of growth, extractive practices, even greed. Yet businesses of all kinds can be not-for-profit – social enterprises, sustainable businesses, cooperatives, and even multinational corporations. Not-for-profit businesses already exist across sectors as diverse as telecommunications, engineering, retail, manufacturing, software development, construction, healthcare and the food industry. A not-for-profit business is one where profit cannot be privately distributed to anyone, including workers or stakeholders as well as shareholders. It is different to a traditional non-profit, which is often dependent on government funding, philanthropy or corporate charity. While some for-profit organizations may never even make any profits, all of them have the ability to privately distribute profits. A company that can distribute profits to individuals (such as owners, shareholders, investors, partners, workers, managers and board directors) is legally for-profit. Although the way for-profit entities handle their financial surplus varies, the key distinction is that they can distribute surplus to individuals, and almost always have the intention to do so. By law, not-for-profit businesses are mission-based and they must invest 100% of their profits back into their mission. Because of this, they are more likely to care about whether or not their supply chains are ethical; about their environmental impact; and about their employees’ wellbeing. They are more likely to take into consideration the concerns of the local communities in which they operate and to give their employees the chance to express themselves. And they are not at all likely to sacrifice any of these concerns in the name of profit-maximization. For-profit companies that are trying to incorporate ethical business practices can easily drift from a social mission due to the pressure to maximize profits or generate financial value for owners and investors. It’s not that for-profit companies can’t do work that has a deeper purpose; rather it’s that the profit motive often distracts them from that deeper purpose. A not-for-profit business works the same as any other business: it must be financially sustainable, everyone gets paid, and it can make as much profit as it likes – but it cannot distribute profit privately. Any surplus is required to be reinvested back into the mission or purpose of the business. These businesses see profit as a means to achieving deeper goals, rather than as a goal in itself. Not-for-profit businesses have many advantages in the marketplace, including being more resilient in times of economic downturn, because they don’t have to provide dividends to shareholders. They also have greater freedom to innovate, due to the absence of owners and shareholders who tend to restrict creative energy to the areas they decide will yield a good financial return. Not-for-profit businesses that constantly cycle their surplus back into the real economy provide a practical, tangible way to redirect the flow of both value and capital, enabling us to prime the wealth circulation pump in the real economy, to meet social needs and ensure we are not undermining our ecological life support systems. If we want to move out of the danger zone of ecological overshoot, we must move away from dependence on profit maximisation and ever more economic growth, which drives extractive behaviour, extreme inequality and destruction of the Earth’s life support systems. If we want an economic operating system that is regenerative, not extractive, we have to change how surplus is managed. Profit is neither inherently good nor bad. But, as the surplus of economic activity, it is important. And what happens to the surplus in our economy is at the root of whether we have a healthy economy or a destructive economy. The not-for-profit model is about preventing value extraction and keeping it invested and circulating in the real economy. It promises value creation, rather than value appropriation, and is a system that runs on shared interest, not self-interest. It can help support the push for worker and open co-operatives, platform co-ops, commons based peer production and, eventually, partially or completely replace the need for ‘transvestment’, as there will be less need for a transfer of capital back from the elite economy to the real economy if the value is retained in the real economy in the first place. An economy based on not-for-profit enterprise would take us beyond the current debate about whether the market should be more heavily regulated or if it should be allowed to operate more freely, because the functioning of a not-for-profit market economy would be so different from the for-profit market economy. The not-for-profit model meets the needs of those who want a market economy, individual choice and reward for effort; those who want a more equitable society, where people’s needs are met; those who champion innovation and technology; and it satisfies those who understand that our wellbeing and safety depend on the health of our environment. It is not a panacea, but it is a practical approach and realistic bridge from the old economy to the new economy, and most importantly, it is already emerging in the world we live in right now. A circular economy can play a crucial role in improving the design and management of our material world. But can we meet our ultimate objective of a sustainable society by improving on the current system, or must we transition to a new system? Any approach which is aligned with or dependent on an economic system based on perpetual growth and the pursuit of more, or one where value is created by many but captured by a few, does not offer the structure that can deliver the changes we need to address our environmental and social challenges. A circular economy is necessary, but not sufficient, for the systemic change we need to get us on track for a secure future. The not-for-profit model is also necessary but not sufficient, though it differs from circular economy in that it is a transformational approach away from the growth paradigm, giving us a better chance to move out of ecological overshoot, and deliver prosperous lives for everyone. A real circular economy would expand the definition of the circular economy to one where its operating system is regenerative not extractive not only towards nature, but people; one where wealth is equitably circulated and shared. A truly circular economy would mean that the circular ethos is also reflected in our social systems, including our financial services, our business structures, and the political frameworks and cultural norms that influence human behaviour. What if circular economy businesses were commenced as, or transitioned to, not-for-profit business models? This is a way to fund circular economies in their truest sense – not just by moving to a circular economy of materials that has to keep growing and maximising profit, but by also making circular the value flows that could help fund the positive social and environmental change we need to make, creating a circular economy of wealth in service of the common good. The Ecological Footprint concept was initiated and developed by the University of British Columbia’s Professor William Rees, who has been teaching the Ecological Footprint concept since the mid-1970s, and Mathis Wackernagel, a PhD student of Rees, went on to further develop and promote the Footprint, founding the Global Footprint Network. http://www.overshootday.org/about-earth-overshoot-day on the supply side, a city, state, or nation’s biocapacity represents its biologically productive land and sea area, including forest lands, grazing lands, cropland, fishing grounds, and built-up land. On the demand side, the Ecological Footprint measures a population’s demand for plant-based food and fiber products, livestock and fish products, timber and other forest products, space for urban infrastructure, and forest to absorb its carbon dioxide emissions from fossil fuels.